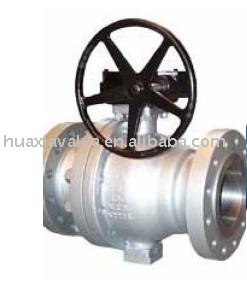 Trunnion Supported Ball Valve manufacturers,Trunnion Supported Ball Valve exporters,Trunnion Supported Ball Valve suppliers,Trunnion Supported Ball Valve OEM service. Trunnion supported ball valves, API6D,Class 150LB--2500LB,2"--56",Firesafe design for petroleum, chemical applications. Notes: The specifications can be designed and satisfied for customers' special requirements.